CORK WOMAN VERA Twomey had medically prescribed cannabis confiscated from her today at Dublin Airport as she arrived from Barcelona in Spain. Twomey has been leading an ongoing campaign to allow her daughter Ava to receive medicinal cannabis products to help with her condition. Ava (7) suffers from a severe form of epilepsy called Dravet Syndrome, and can suffer from several seizures a day. Twomey says that medicinal marijuana in liquid form has the potential to save her daughter’s life, as it reduces the frequency of her seizures. She travelled to Barcelona in Spain to see a specialist and was prescribed THC oil medication to help with her daughter’s condition. This type of medication is banned in most cases in Ireland. Twomey declared this medication with customs when she arrived at Dublin Airport from Barcelona at about midday this afternoon. She was held and interviewed by customs officials for about 45 minutes and the bottle of THC was confiscated. Speaking to TheJournal.ie, Twomey said that she had done nothing wrong and that she felt strongly that she should be allowed to give her daughter THC. “We feel very strongly that we did nothing wrong and that this medication is necessary to save the lives of children like my daughter,” she said. We went through customs and declared the medication. We willingly gave the bottle [to customs officials] and they confiscated it. Twomey’s daughter Ava has been on a CBD-based treatment since last October, and has shown a marked improvement. This product contains very little THC — the active substance in cannabis which results in a high. Vera has been campaigning for months now for the stronger THC-based medication, which she says will help her daughter. 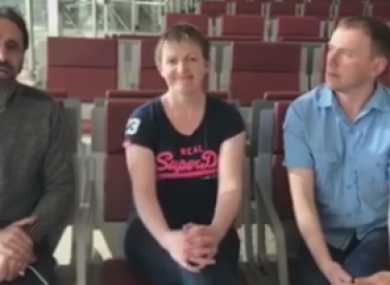 She travelled to Barcelona with Dublin TD Gino Kenny and Independent MEP Luke ‘Ming’ Flanagan. She met with a consultant at the Kalapa Clinic in Barcelona, and they prescribed the drug for Ava. “We met with a consultant… and he determined that Eva was a candidate [for the medication] and that it would be necessary for seizure control that she would have THC alongside CBD,” said Twomey. The Kalapa Clinic is a European medical consultancy that develops alternative health therapies using cannabinoids (for example, THC). Medicinal cannabis can be legally prescribed in Spain as well as several other European countries. Ava did not travel to Barcelona with her mother as Twomey determined it was too risky for her with her condition. Twomey said that she was treated with the “utmost respect” by customs officials and that there was no question of her being arrested for bringing the product to Ireland. “I am doing nothing wrong. I’m doing everything I can for my daughter,” said Twomey. It’s incredibly important that [Minister for Health] Simon Harris takes it serious that a woman with four children under the age of seven has to go to another country to get access to medication for her child. Earlier, Luke Flanagan had said in a Facebook post that Twomey had taken action “by going abroad and importing something that the state deemed immoral”. “Arrest her and deny her child the medicine she needs, or let her through and collapse this farce,” said Flanagan. Twomey previously walked from Cork to Dublin to highlight her daughter’s case. She has called on the Department of Health to act in order to help her daughter. She has organised another walk around Cork city for tomorrow. Last month, an expert panel of doctors began to draw up guidelines on how medicinal cannabis can be prescribed in Ireland. Email “Vera Twomey stopped at Dublin Airport attempting to bring medicinal cannabis into the country ”. Feedback on “Vera Twomey stopped at Dublin Airport attempting to bring medicinal cannabis into the country ”.